A fat cat may appear happy and provide visitors with a source of amusement, but feline obesity is certainly no laughing matter. Cats who carry excess weight have a heightened risk for diabetes, cancer, liver problems, degenerative joint pain and other conditions that could severely curtail its quality of life. Recent studies discovered that more than half of all dogs and cats are diagnosed as either overweight or obese by their veterinarians. 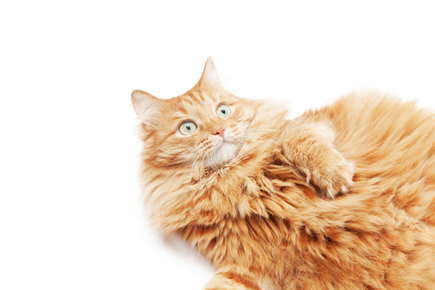 Fortunately, there are simple steps you can take to keep your feline from getting fat. The most obvious reason for feline obesity is the ingestion of more daily calories than a cat can burn off through activity or normal metabolic processes -- the same basic issue faced by so many overweight humans. If your cat is encased in a thick layer of fur, you may have trouble telling whether he is overweight. You should feel deeply with your hands to see if you can feel ribs, spine or hip bones. You can also compare your cat to the body condition charts developed by Purina diets that are used by all veterinarians. If your cat is too heavy, do some serious thinking about your cat's eating habits and activity level. The main tip for keeping your cat at a good weight, or getting your overweight cat to lose weight, is to feed them only canned food. In order for manufacturers to make a food dry, they have to add a lot of carbohydrate to the ration. It is believed that cats need more of an Atkins-type diet, high in protein and low in carbohydrate. It should be a good quality food, balanced with the right proportion of protein, fats, etc, and formulated according to AAFCO guidelines. You should look for this statement in the fine print on the can. Since calories that go unburned will only turn to fat, you may need to get your sedentary cat moving if you wish to keep him from getting heavy. Try playing games with him, or get him a canine or feline playmate who will keep him on his toes. Senior pets are at a disadvantage due to their slower metabolism, especially if they cannot move as freely or comfortably as they once did. For these animals, dietary reductions and modifications, coupled with supplements such as glucosamine or omega-3 fatty acids to ease joint problems, may prove helpful. Changing a cat's eating habits may require changes in his owner's behavior as well. Veterinarians urge owners to reduce the number of treats and remove their cats from the dining room during human mealtimes. Levs, Josh. “Obesity Epidemic Strikes U.S. Pets.“ CNN, 2012. "Dr Allen is absolutely amazing. I contacted her because my elderly cat Clara was very ill, and needed to be put to sleep. My regular veterinarian did not do House Calls and I wanted Clara's passing to be as comfortable as possible- in her own home, on her own bed, surrounded by peace and love. Dr Allen came to my home within three hours of my phone call. She was overwhelmingly kind to both Clara and me. Clara's passing was completely serene, which was exactly what I wanted. I CAN NOT recommend Dr Allen's veterinary services enough. She is simply a WONDERFUL veterinarian, and all pets deserve a doctor like her."